Do you keep a journal? I love the idea of journaling, but the only journal I have is a prayer journal. Even with great intentions to keep a journal about each day, it only lasts about a week until either 1) I don't feel like I have significant things happening each day or 2) I just don't feel like spending the time each day to write down what's going on. My solution is Keel's simple diary (one of my birthday presents from Caleb). 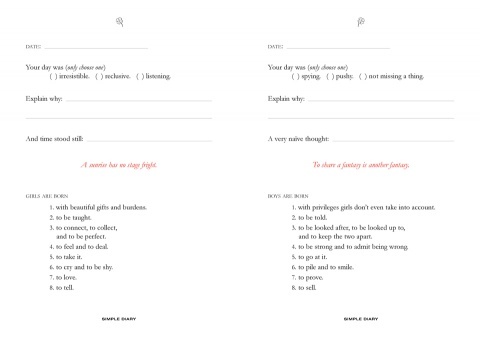 It's more of a guided journal, with a few blanks to fill in or questions to answer about your day. It's quick, it's kind of weird, and I like it. If you're like me and just can't seem to get on track with journaling regularly, here are some more creative journals that might be helpful and fun. painting with coffee, poking holes in the pages, etc. nope. i don't have a journal. I used to keep one years ago. That reminds me, maybe I should start back? I guess blogging has replaced journaling for me here lately. I don't keep a journal but often times think I should. I have started several times but then it always fizzles out. When the kids were younger I did try to write down little things they said. It is so fun looking back at them! i don't journal although i like the idea of a journal with purpose, i.e. easy to fill in or asks you questions. I did a journal from 5 to 10th grade I think. Now I do travel journals! I have a prayer journal for myself and I keep a journal of some prayers for my husband...I think I'll give it to him when he has a crummy day to cheer him up. I guess the only other journal I keep are photo albums (I make sure to have our pictures printed 2x a year, so they don't just sit on the computer after I clear my camera) and our blog. Maybe I should write more down? This guided journal is really neat; I've never heard of anything like it! love the "i was here" journal! i have one, but i never use it.. i tend to write the to-do-stuff on the calendar i have hanging on my was haha! I'm not very good at keeping a journal, but My husband and I started a family blog a few years ago and we plan to print a book from it with some of our favorite posts. I do have a "special occasions" journal where I try to at least write down special events like birthdays and holidays...but I haven't been too good at that lately :( I love all of the different journals you found... especially the one where you write 1 line a day, I think that is something I could do! i'm terrible at keeping my journal....but i refuse to give up on it! i used to be diligent about keeping a journal, but my blog has replaced a lot of that in some sense. as long as i have some sort of output for my thoughts, i'm good to go. I have seen that wreck me and I LOVE IT! I kinda think I need one! I kept a long-term journal for about five years that I wrote in semi-regularly. It's fun to go through it and revisit the teen drama! I agree with the others; blogging is definitely the modern journal. Short, sweet, and visually stimulating. Sounds like our generation, doesn't it? But I have to say I love it! I have a journal that I do tend to write in everyday or at least every other day. It might not always be filled with the most interesting of things, but it is a great place for me to keep track of my thoughts and little things that I don't want to forget. Thank you so much for your comment on my blog Sherri :) it's such a pleasure to read yours! ...I'll be a follower , please feel free to follow mine if you want ! Here is a little trick to keep a journal alive and also a good reason to smile every day: I have a little book on the night table and every night before I fall asleep I write down the thing that made that day a special day , a special (funny or silly) thing that made me thankful for that day... You 'll be surprised when you'll discover the beauty of such simple things like a cappuccino for breakfast or the smell of your man next to you in the morning ... They can really make your day! i love the idea of a fill in the blank journal! what a sweet (and easy!) idea. I love the MyQuotable kid one.. the things my kids say is just amazing. I really think I should keep start writing one again. I used to be so good with journaling. It was a huge hobby of mine, especially when I was younger and there were so many boys to write about. ;p Now I don't write in my journal as much as I'd like too. This is a good reminder though! I only kept a journal for one year of my life. It was my senior year of college and it turned out to be one of the most memorable and journal worthy years I have had so far. I definitely wish I had kept it up. I have journals - I totally never use them (wait does my blog count haha) but I do have a wine tasting journal - very useful and well used! I've had so many journals, but could never keep them up. But I also love the look and feel of journals just for their beauty. I now kind of look at blogging as a modern form of journalling.